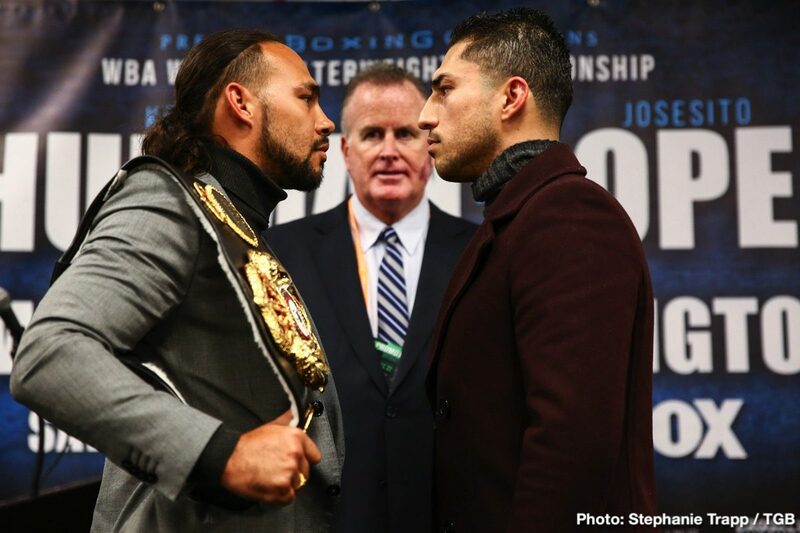 As fans know and are quite excited about, unbeaten welterweight star Keith Thurman makes his ring return this Saturday night, ending a long, 22-month layoff that was injury-forced. “One Time,” who still holds the WBA title, will face the seriously tough Josesito Lopez in his comeback fight and fans everywhere can’t wait to see how the 30 year old looks in his first fight since decisioning Danny Garcia back in March of 2017. Lopez is very much the forgotten man in this fight (he may make us all remember him big-time come Saturday) and already, people are asking about the big fights involving Thurman. At a media workout yesterday (caught on video by Fight Hub), Thurman spoke about a number of things – including the possibility of him fighting Manny Pacquiao in the near future – and that big fight with Errol Spence was addressed. “Keith Thurman Vs. Errol Spence isn’t worth one title, it’s not worth two titles, it should be worth three titles, baby,” Thurman said. Thurman says he will take one fight at a time during his comeback, but he did say he aims to regain the WBC title he never lost in the ring. This could mean, brilliantly, that Thurman and Shawn Porter will rumble again, in a return of their awesome June 2016 war, with Thurman aiming to repeat his decision win and get back the green belt. Then, hopefully some time this year (but perhaps more likely early next year) Thurman and Spence will clash in a huge, WBC/IBF/WBA welterweight unification showdown. Thurman has a ways to go before this fight can happen (again, we should be hesitant to write off Lopez on Saturday, and it’s absolutely no certainty that Thurman gets past Porter a second time), but both great 147 pounders want the fight. And that’s really all that matters.